Prices quoted are per bar and are given for guidance only. 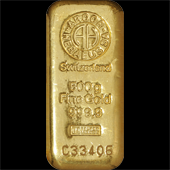 In addition to the Helvetia Gold Ounce, we offer cast bars from 100 grams to 1 kilo at the latest Daily Prices. The gold bars minted by Argor Heraeus SA are fabricated in “Good Delivery” LBMA standard fine quality 999.9 and are accompanied by a quality certificate.